Pura Batukaru or Luhur Watukaru temple, is one of the biggest Hindu Temples in Bali (Sad Kahyangan) with Catur Lokapala Temple and Padmabhuwana Temple status. Why Batukaru Temple is special ? Pura Luhur Batukaru is a Hindu temple in Tabanan, Bali, Indonesia. Originally built during the 11th century, Pura Luhur Batukaru was dedicated to the ancestors of the rajas of Tabanan. It was destroyed in 1604, but rebuilt in 1959. The temple's most important shrine is a 7-tiered meru dedicated to Mahadewa, the God of Mount Batukaru. Today, Pura Luhur Batukaru remains an extremely sacred site for Bali's Hindu population. Many of the complex's grounds remain off-limits to visitors for various ceremonies and events throughout the year. The temple is also the first stop one must take before ascending to the summit of Mount Batukaru. A pilgrimage takes place to the peak once a year, and may see thousands of worshipers walk its trails at once. What to explore at Batukaru Temple? The temple is high on the slopes of the mountain and the often misty, drizzly micro-climate here just adds to its undoubtedly mystical atmosphere. Due to the cool climate and high rainfall (has the highest rainfall on Bali), the shrines in this temple are covered by moss. 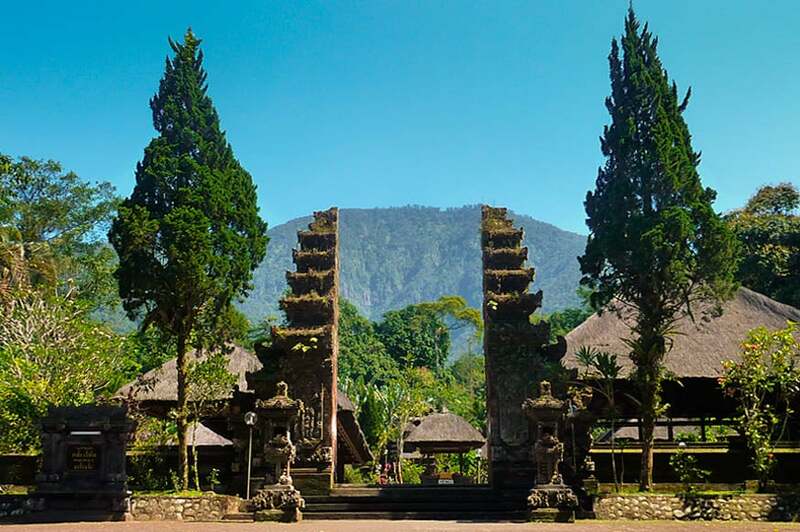 The three elements temple area of Watukaru or Batukaru is equal to other temples in Bali generally which is consisted of outside area (Nista Mandala), Middle area (Madya mandala) and Center area (Utama Mandala). After refurbishing three temples are of this temple in some years ago, the element conception and structure of these three temple areas are progressively become everlasting and conceptual. The three elements temple area of Batukaru temple - Bali is consisted of outside area (Nista Mandala), Middle area (Madya mandala) and Center area (Utama Mandala). After refurbishing this temple, the element conception and structure of these three temple areas are progressively become everlasting and conceptual. How to get to Batukaru Temple? It can rain quite often since the temple is in the mountain and in a mist foggy area, so bring your raincoat. Temple rules posted near the entrance outline where visitors can and cannot go on the grounds. To enter the temple you must wear sarong, and they are available on site. A visit early morning or late afternoon adds some magic to the situation, as the temple is surrounded by what looks like a very thick forest. Note that you will have to walk quite a bit to get up to the main temple. There are many places of amazing interest in the region of Tabanan, but this is the real epicentre of Balinese Life in Tabanan. Many local people from this area, follow their pathway through life which often takes them to other areas of Bali for work, accommodation, family life. However, they are all very much convinced that their real ancestors are living in this Temple. At least twice per year, they make an effort to return to Pura Luhur Batukaru to pay their respects and keep their connection to the past family members. It is very spiritual, calming and leaves you feeling very internally cleansed. Something to always remember, respect and hopefully return to for another visit. The local people are always welcoming, helpful and any pricing is reaonable - across the board. Touch base with this Temple, for a memorable visit.